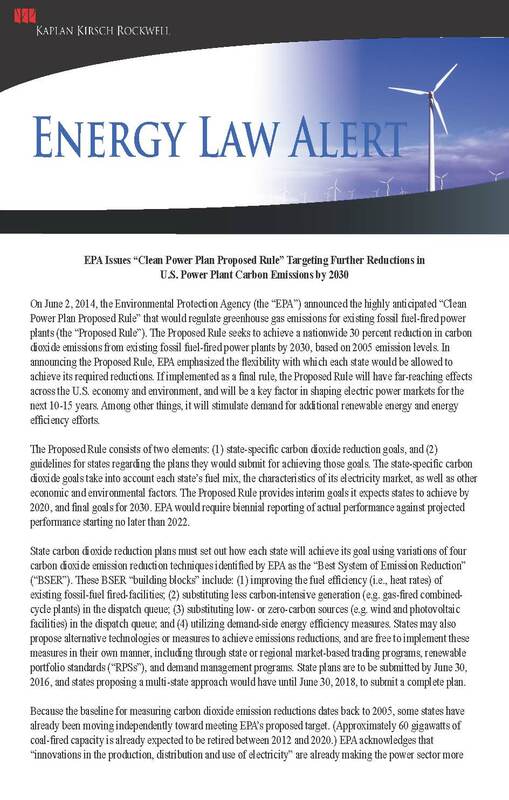 On June 2, 2014, the Environmental Protection Agency (the “EPA”) announced the highly anticipated “Clean Power Plan Proposed Rule” that would regulate greenhouse gas emissions for existing fossil fuel-fired power plants (the “Proposed Rule”). The Proposed Rule seeks to achieve a nationwide 30 percent reduction in carbon dioxide emissions from existing fossil fuel-fired power plants by 2030, based on 2005 emission levels. In announcing the Proposed Rule, EPA emphasized the flexibility with which each state would be allowed to achieve its required reductions. If implemented as a final rule, the Proposed Rule will have far-reaching effects across the U.S. economy and environment, and will be a key factor in shaping electric power markets for the next 10-15 years. Among other things, it will stimulate demand for additional renewable energy and energy efficiency efforts. 2020, and final goals for 2030. EPA would require biennial reporting of actual performance against projected performance starting no later than 2022. State carbon dioxide reduction plans must set out how each state will achieve its goal using variations of four carbon dioxide emission reduction techniques identified by EPA as the “Best System of Emission Reduction” (“BSER”). These BSER “building blocks” include: (1) improving the fuel efficiency (i.e., heat rates) of existing fossil-fuel fired-facilities; (2) substituting less carbon-intensive generation (e.g. gas-fired combinedcycle plants) in the dispatch queue; (3) substituting low- or zero-carbon sources (e.g. wind and photovoltaic facilities) in the dispatch queue; and (4) utilizing demand-side energy efficiency measures. States may also propose alternative technologies or measures to achieve emissions reductions, and are free to implement these measures in their own manner, including through state or regional market-based trading programs, renewable portfolio standards (“RPSs”), and demand management programs. State plans are to be submitted by June 30, 2016, and states proposing a multi-state approach would have until June 30, 2018, to submit a complete plan. Because the baseline for measuring carbon dioxide emission reductions dates back to 2005, some states have already been moving independently toward meeting EPA’s proposed target. (Approximately 60 gigawatts of coal-fired capacity is already expected to be retired between 2012 and 2020.) EPA acknowledges that “innovations in the production, distribution and use of electricity” are already making the power sector more efficient and sustainable, and therefore states that the Proposed Rule would “reinforce and continue this progress.” As some states are further along the process for compliance than others, some states will see more incremental change than others under the Proposed Rule. EPA explicitly proposes to allow states the flexibility to use existing renewable energy, energy efficiency, emissions trading, and other state programs and multi-state initiatives to comply with the Proposed Rule’s requirements. EPA provided this flexibility to avoid penalizing states that have already started emissions reduction efforts. Thus, for example, existing RPS requirements in place in 29 states and the District of Columbia can help provide some of the emissions reductions required under the Proposed Rule, along with existing demand side management programs. Similarly, state programs such as California’s Global Warming Solutions Act, Colorado’s Clean Air-Clean Jobs Act, and the Northeast’s Regional Greenhouse Gas Initiative can provide much of the emission reductions required to satisfy the proposed state-by-state targets. The Proposed Rule encourages the continued implementation of individual state RPSs as part of the mix that will allow each state to comply with its carbon reduction target. The 30 mandatory RPSs currently in place (including DC), and the non-binding renewable energy goals established in seven other states, already shape the country’s development of renewable energy by requiring a certain percentage of power delivered to customers, thereby reducing carbon emissions associated with existing fossil-fueled generation. One effect of the Proposed Rule will likely be a continuing evolution of RPS policies in states with existing RPSs, and the development of new RPSs in other states. There are many factors that may impact the adoption of the Proposed Rule as a final rule, including political pressures from coal states. The Obama Administration chose the rulemaking path in an effort to side-step Congress, and (as currently constituted with Democrats in the majority) the Senate is poised to protect the President’s carbon policy initiative. The courts will likely end up providing the critical battleground for the implementation of the Proposed Rule. Some stakeholders are likely to challenge EPA’s legal authority to promulgate the Proposed Rule. EPA issued its Proposed Rule under Section 111(d) of the Clean Air Act. Section 111(d) requires EPA to issue regulations requiring states to implement standards of emissions performance for existing stationary sources (such as power plants) of pollutants that EPA finds “causes, or contributes significantly to, air pollution which may reasonably be anticipated to endanger public health or welfare.” Because EPA has previously found carbon dioxide to endanger human health and welfare, and has found the power sector to contribute to such an endangerment, it has indicated that it believes it must issue a rule governing existing power plants. Comments on the 645-page Proposed Rule are due by October 1, 2014. In addition, EPA will hold four public hearings during the week of July 28, 2014, in Atlanta, GA; Denver, CO; Pittsburgh, PA; and Washington, DC. Interested participants must pre-register by July 25, 2014. EPA has indicated that it plans to issue a final rule by June 1, 2015. A PDF of this Energy Law Alert is available.